ABOVE: THE THREE AMIGOS FROM MAINE - Left to right: Rev. 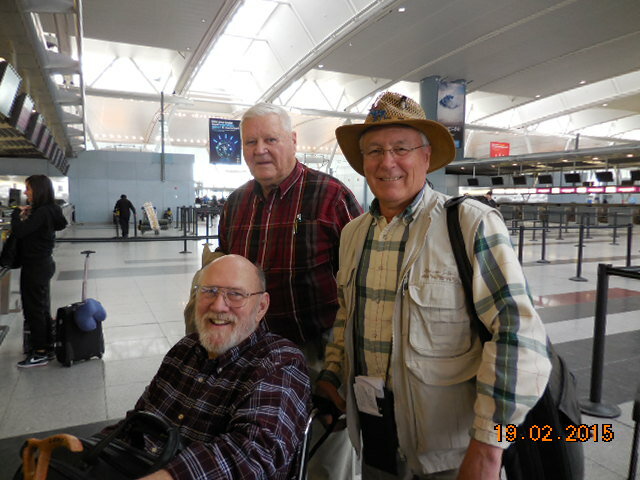 George Hardy [ret], Charlie Barker, and Ed Jesteadt as we checked in at JFK. 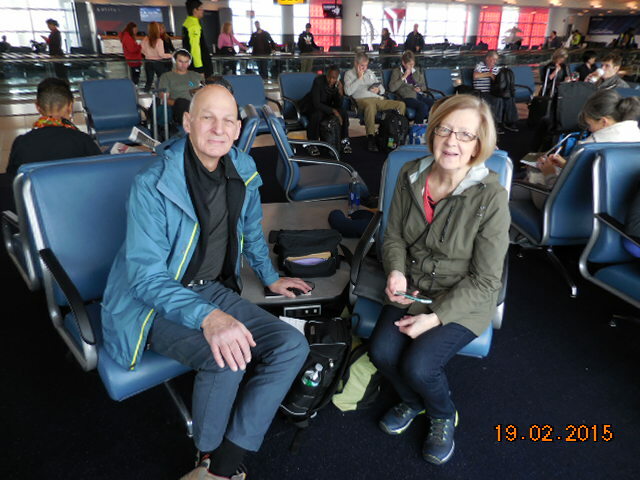 BELOW: Two friends of Ed's - formerly from Flemington, NJ; now living in Delaware - Ed & Darlene Scott. This photo taken in Johannesburg's Tambo Int'l Airport. The article below was written by Charlie Barker in collaboration with Ed Jesteadt. For an "easy to print" version of this article, please click HERE. On my first visit in 2005, I found a friendly, sociable, loveable, easygoing people – deplorably poor – but willing to share their meager resources. They are the result of two centuries of racial separation and over 40 years of apartheid, which was repealed in 1991 and led to the election of Nelson Mandela in 1994 as its 1st black president. They remind me of our history and the way the freed slaves must have been after the Civil War. 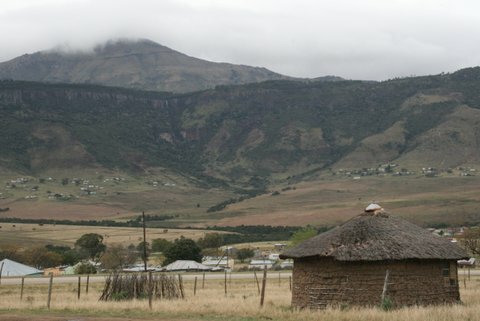 In the picture above, a typical ‘rondaval’ [circular daub & wattle home with a thatched roof] is in the foreground, with the Amatola Mountains [Hogsback] overshadowing the northern end of the Tyhume Valley. We stayed up on Hogsback for our 1st two weeks, and visited the village of Sompondo shown at the base of the mountain, as well as 10 other villages in the valley. When the blacks were forced to ‘return to their homelands’ in the 1960’s and 70’s – they did so with few assets and no prospect for employment, other than subsistence farming. I heard the comment “Our land is not producing nearly as well as under white rule.” The land shows where it was tilled years ago, expertly terraced, but now mostly acres [hectares, in their culture] overgrown with thorn bushes [acacia trees]. What could we do to help them with their meager resources – what did they really need? Having lived through the Great Depression before WWII, I realized how important our home garden was to our pride and sense of independence. Can we help the people rebuild their pride, utilizing what resources they do have, and improve their lifestyle? I could see many resources available, such as ample land and plenty of labor, and they could utilize both to significantly improve their standard of living. In order to have a garden, they needed to keep the cows, pigs, chickens, goats and sheep out of the gardens - there is no need for a lawnmower with free range animals roaming everywhere, but fencing is critical. They also needed tools with which to work the soil. And in this lovely valley, droughts are fairly common, as compared to plentiful rainfall in the Amatola Mountains above. Training in water conservation techniques was clearly needed. They do have other obstacles with which to deal, such as HIV and AIDS. Given the paucity of their health care system, in 2007 we began helping Dr. Norma – a private doctor who decided to provide antiretroviral drugs to treat AIDS free of charge to the people on Hogsback [atop the Amatola Mountain] and in the valley below [the Tyhume Valley]. She did this until the end of 2010, when the government took over sole distribution of ARVs. But for many, the drugs came too late. As a result of the AIDS pandemic, there are now many grandparents in the villages who are raising their AIDS-orphaned grandchildren. Critical to the AIDS’ drug effectiveness, and the needs of growing young children, is adequate nutrition – and thus we decided to focus on home gardens. Progress in the gardening project has been slow. 1st – fencing is expensive; and 2nd – adequate instruction and ‘showing by example’ are crucial to instructing them on gardening techniques using the resources they have. I said if I could spend 6 months or more I could have some impact, but the language barrier is a real problem - they can understand spoken English far better than I can understand Xhosa! 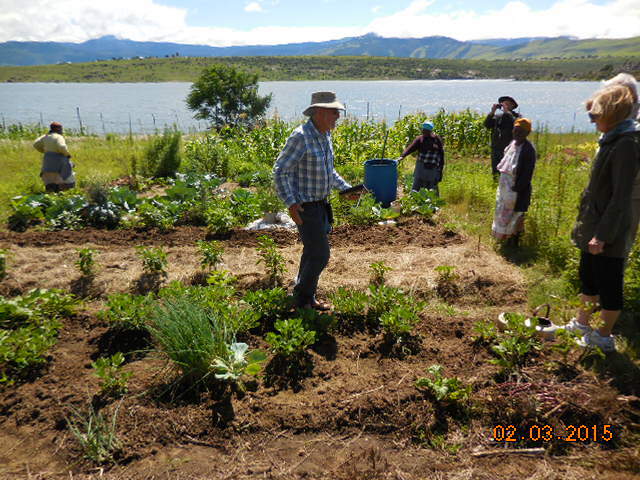 Around the time we started helping Dr. Norma, we hired Tim Wigley [right, in the Mazotsho communal garden] – an expert in natural, organic home gardening – to conduct a 12-day training program for 17 families in 4 villages. In a 2012 visit, Ed & Bonnie Jesteadt stayed an additional two weeks after most of us returned to the USA, and they found another expert – Artwell Chivhinge – [below, at a home garden in Jonini]. Both men are fluent in Xhosa – and they are TWO of a small cadre of prominent natural gardening experts in all of South Africa; God is indeed smiling on our efforts! Above is Artwell Chivhinge - talking with the woman and giving her feedback on the condition of her garden based on the rating system Tim Wigley has developed. This is the garden of J. Sompondo, in the village founded by his great-grandfather. Notice how the vegetables are planted on the raised beds, and between the beds are furrows where one walks when tending the garden, and which also serves as a collector of rainwater. It is laid out using an "A" frame to assure the bottom of the furrow is level from end to end. In this design, there is always something growing, and the raised beds are always covered with mulch. As I mentioned before, the most effective training includes “showing by example” – as well as doing periodic visits to assure what the trainer said is what the gardener heard. 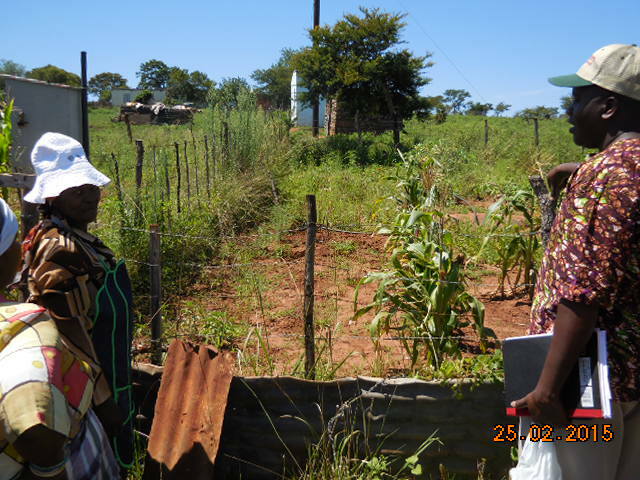 Our gardening project has now expanded to include periodic visits to the villages by Tim and Artwell. We planned this trip to overlap with one of their visits - the 1st week was spent with Artwell and the 2nd week with Tim. Our team consisted of me, Ed, Rev. George Hardy, Ed & Darlene Scott [friends of SAP], Mrs. Winnie Maneli, Ernest Jwambi, and during the 2nd week, it also included Richman Xuza. Winnie, Ernest and Richman are the core of the “Senior Committee” – more on that later. A typical meeting with a village committee, at one of their homes, would start with singing, a prayer, then the introduction of our team, and then all of the gardeners. There would be a brief question and answer period, and at some point there would be the inevitable morning [or afternoon] tea, served with home-made bread cooked over an open fire. This was followed with the entire group visiting several members’ gardens or the communal garden – or both. Tim has developed a rating system for the gardens that includes 9 indicators, based on his training program. It was quite satisfying seeing how proud the people were of their garden as he evaluated them on things like mulching, water conservation, contouring, limited tilling of the soil, the variety of vegetables, the number and types of fruit trees, preparation of natural pesticides and fertilizers, composting, and harvesting of seeds for the next planting cycle. I believe we’re on the right track in hiring our two consultants for the frequent follow up visits. We also instituted two new elements during this trip:  giving copies of the 9-point evaluation to the home gardener for her reference [~80% are women] for ongoing improvement, and  identifying ‘supervisors’ in each village who will become the future monitors and trainers as we reduce our ‘dependence’ on Tim & Artwell. The picture is J. Sompondo’s garden in the village of Sompondo – a ‘model’ garden. The Home Garden Constitution developed by the Senior Committee and MATE-SAP spells out the requirements for eligibility to join the Home Garden committees in each village – identifying the neediest families: those with grandparents caring for their grandchildren whose parents have died from AIDS, other orphans, and families without any income. It also stipulates that anyone in the village can partake of the training during Tim & Artwell’s visits. On this trip, we also met two professors from Fort Hare University who are doing a research project and report on the needs of the people in the Tyhume River Valley [a larger area than “our Tyhume Valley”]. We hosted them on a visit to Sompondo and Mazotsho to show them our project, and hope much of what we are doing is captured in their report and becomes part of their recommendation for ongoing support by the government. Give the people some fencing, a few simple tools and training – they can do the rest! In summary, I feel the project is worthwhile – we are meeting the goal of bringing human dignity and self-sufficiency to the people there. They beam with pride as they show off their gardens – I have seen progress with each of my 4 visits there. They are moving towards self-sufficiency in the training and monitoring aspects as well. 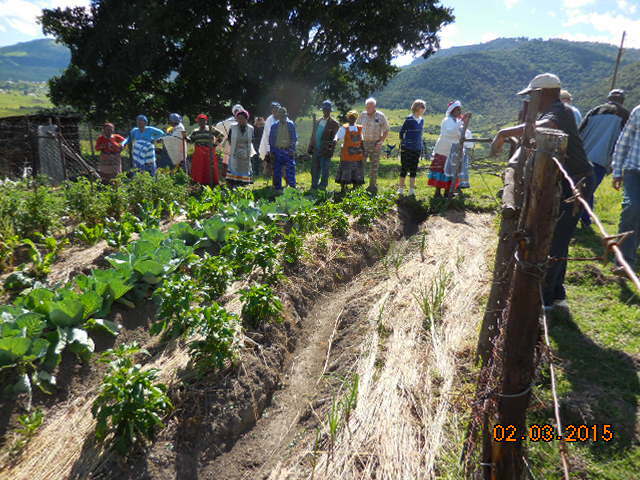 In 11 villages in the project, there are about 260 families, and just shy of 1,000 widows, orphans, grandparents and other family members directly benefitting from the Home Gardens Project.